In Christian theology, the beatific vision (Latin: visio beatifica) is the ultimate direct self-communication of God to the individual person. A person possessing the beatific vision reaches, as a member of redeemed humanity in the communion of saints, perfect salvation in its entirety, i.e. heaven. The notion of vision stresses the intellectual component of salvation, though it encompasses the whole of human experience of joy, happiness coming from seeing God finally face to face and not imperfectly through faith. (1 Cor 13:11–12). It is related to the Catholic and Eastern Orthodox belief in theosis, the Wesleyan notion of Christian perfection, and is seen in most – if not all – church denominations as the reward for Christians in the afterlife. In Christianity, the Bible teaches that God "dwells in unapproachable light, whom no one has even seen or can see" (1 Timothy 6:16), but when God reveals Himself to us in heaven we will then see Him face to face (1 Corinthians 13:12). This concept has been termed "the beatific vision of God" by theologians of the Catholic Church as well as various Protestant denominations, including the Lutheran Church and the Methodist Church. Saint Cyprian wrote of the saved's seeing God in the Kingdom of Heaven. How great will your glory and happiness be, to be allowed to see God, to be honored with sharing the joy of salvation and eternal light with Christ your Lord and God... to delight in the joy of immortality in the Kingdom of Heaven with the righteous and God's friends! Spirit of Holiness, let all thy saints adore / thy sacred energy, and bless thine heart-renewing power. / No angel tongues can tell thy love's ecstatic height, / the glorious joy unspeakable, the beatific sight. In Catholic theology, the intercession of saints is valid because those who have died in the Faith are with God in Heaven and enjoy the Beatific Vision, i.e., unmediated access to God's Presence, actually in Paradise itself, seeing God. Thomas Aquinas defined the beatific vision as the human being's "final end" in which one attains to a perfect happiness. Thomas reasons that one is perfectly happy only when all one's desires are perfectly satisfied, to the degree that happiness could not increase and could not be lost. "Man is not perfectly happy, so long as something remains for him to desire and seek. "STh I–II, q., 3, a. 8. But this kind of perfect happiness cannot be found in any physical pleasure, any amount of worldly power, any degree of temporal fame or honor, or indeed in any finite reality. It can only be found in something that is infinite and perfect – and this is God. STh I–II, q. 2, a. 8. And since God is not a material thing but is pure spirit, we are united to God by knowing and loving him. Consequently, the most perfect union with God is the most perfect human happiness and the goal of the whole of the human life. But we cannot attain to this happiness by our own natural powers; it is a gift that must be given us by God, who strengthens us by the "light of glory" so that we can see him as he is, without any intermediary. (Thomas quotes Psalm 36:9 on this point: "In your light we shall see light. ")STh I, q. 12, a. 4. Further, since every created image or likeness of God (including even the most perfect "ideas" or "images" of God we might generate in our minds) is necessarily finite, it would thus be infinitely less than God himself.STh I, q. 12, a. 2. The only perfect and infinite good, therefore, is God himself, which is why Aquinas argues that our perfect happiness and final end can only be the direct union with God himself and not with any created image of him. This union comes about by a kind of "seeing" perfectly the divine essence itself, a gift given to our intellects when God joins them directly to himself without any intermediary. And since in seeing this perfect vision of what (and who) God is, we grasp also his perfect goodness, this act of "seeing" is at the same time a perfect act of loving God as the highest and infinite goodness. Pope John XXII (1316–1334) caused a controversy involving the Beatific Vision. He said not as Pope but as a private theologian that the saved do not attain the Beatific Vision until Judgment Day, a view more consistent with soul sleep. 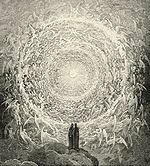 The general understanding at the time was that the saved attained Heaven after being purified and before Judgment Day. He never proclaimed his belief as doctrine but rather as an opinion (see ex cathedra, as defined at the First Vatican Council in 1870). The Sacred College of Cardinals held a consistory on the problem in January 1334, and Pope John backed away from his novel views to the more standard understanding. His successor, Pope Benedict XII, declared it doctrine that the saved see Heaven (and thus, God) before Judgment Day. ^ K. Rahner. "Beatific Vision". Sacramentum Mundi. An Encyclopedia of Theology. 1. pp. 151–153. ^ Cf. Gregory of Nyssa. De Beatitudinibus 6, PG 44, 1265A. ^ Wesley, Charles. "Maker, in Whom We Live." The United Methodist Hymnal. Nashville: The United Methodist Publishing House, 1989. 28 May 2018. <https://hymnary.org/hymn/UMH/88>. ^ "Deification". Oxford Dictionary of the Christian Church. 2005. ^ a b "God in Heaven". Lutheran Church Missouri Synod. Archived from the original on 11 May 2009. Retrieved 2007-10-31. ^ "What United Methodists Believe". Spring Lake United Methodist Church. Archived from the original on 27 September 2008. Retrieved 2007-10-31. ^ Pace, Edward. "Beatific Vision." The Catholic Encyclopedia. Vol. 2. New York: Robert Appleton Company, 1907. 5 Jan. 2011 <http://www.newadvent.org/cathen/02364a.htm>. ^ Summa Theologiae, I–II, qq. 2–5. K. Rahner (1968). "Beatific Vision". Sacramentum Mundi. An Encyclopedia of Theology. 1. London: Burns & Oates. pp. 151–153. ISBN 0-223-29384-9. "Deification". Oxford Dictionary of the Christian Church. Oxford University Press. 2005. ISBN 978-0-19-280290-3.